Kershaw-Ryan State Park encompasses a canyon of contrasting beauty. Below the rugged, rainbow hued cliffs a sage ribbon of valley meanders upward into a verdant oasis, a rare jewel set into the rough geology of the high desert. Those who first visit Kershaw-Ryan are amazed by the prolific growth of trees, vines, and flowers offering welcome shade and color to the desert weary traveler. Park elevations range from 4,312 to 5,175 feet above sea level. Summers are dry and warm, with daytime temperatures reaching above 95˚F and nights in the 50s. Monthly rainfall averages less than an inch, but during the late summer thunderstorms can produce flash floods. 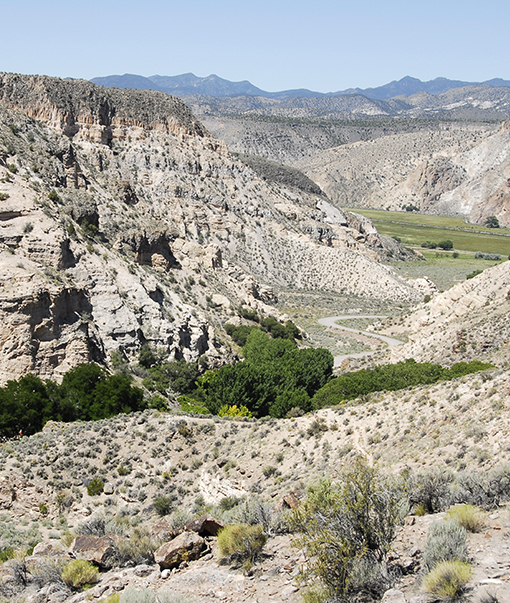 Caution should be taken if hiking the canyon trails during July and August. Winters can be cold with snow on the ground in December and January. Daytime highs in winter may only reach 40˚F.